The preview of the Draenei Micro Defender is still somewhat incomplete in the Pet Journal, however Wowhead has a fantastic 3D model preview of what this pet may look like once finished. Check out those shields! Player character models will be undergoing major changes in WoD. 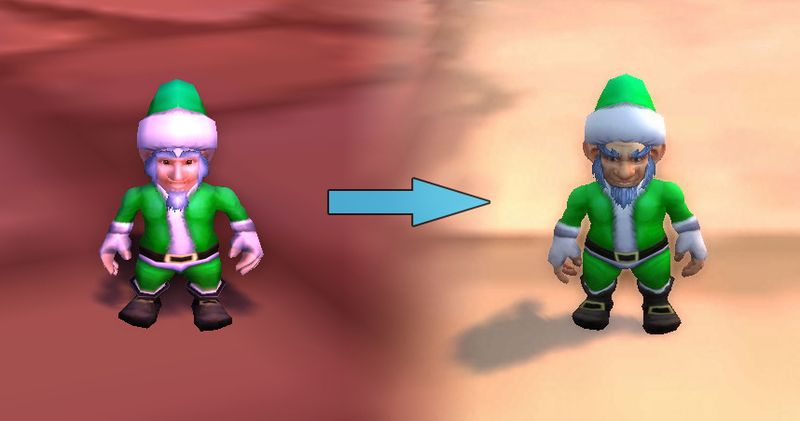 As a side effect of these updates, a few of our pets will also be receiving a small face-lift. Not all pets will be affected, and only those that share similar looks to the updated character models will be altered. Currently the Argent Squire and Argent Gruntling remain unchanged. We'll miss these familiar old faces, but our pets will still be the same lovable companions that we cherish and adore. Wonder why they're updating these models but not Peddlefeet who still has the old Goblin model? The part about updated models for pets that share models with player characters is a bit odd to me. I'm glad they are doing it to be sure, but if they are doing it here, why not update other old pet models? Old frog/toad pets still look terrible, despite the fact that they have made an all new model that looks much much better. Ooohohoho! That Draenei Defender looks AMAZING. I hope it's rare enough to make it an infrequent sighting.